To drown me in thy sister's flood of tears. Mermaids are mythological aquatic creatures with a female human head and torso and the tail of a fish. 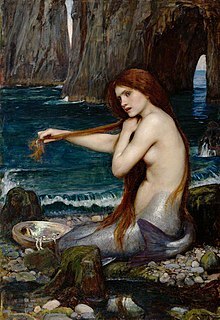 Mermaids are represented broadly in folklore, literature and popular culture. And lure, in seraph-strains, unpitying, to destroy. William Shakespeare, The Comedy of Errors (c. 1592-94), Act III, scene 2, line 45. To hear the sea-maid's music. William Shakespeare, A Midsummer Night's Dream (c. 1595-96), Act II, scene 1, line 149. "Who is it loves me? who loves not me?" Alfred Tennyson, The Mermaid; reported in Hoyt's New Cyclopedia Of Practical Quotations (1922), p. 511. Shrill music reach'd them on the middle sea. Alfred Tennyson, The Sea Fairies; reported in Hoyt's New Cyclopedia Of Practical Quotations (1922), p. 511. William Butler Yeats, "A Man Young And Old: III. The Mermaid" (1926). I must be a mermaid... I have no fear of depths, and a great fear of shallow living. I think every little girl's dream is to be a mermaid or to see a mermaid. [When I was younger] I would go to the beach and cover myself in the sand. People from different cultures and centuries have the same idea of what mermaids are... so that's maybe a cool thing to think about. Today's mermaids are fun-loving and friendly. The frightening, destroyer sirens of the past have been ousted in favor of pleasure-seeking playmates. Their youthful abandon, grace and sense of freedom invite us to lighten up. They remind us to enjoy life and glide through the waters of life, rather than struggling. Perhaps these bathing beauties are just what we need now to help us escape from the stress of the modern world and our anxiety about the future. This page was last edited on 25 July 2018, at 12:55.